In February 2016 we applied to the Arts Council of Wales to become a Lead Creative School and we were very excited when some months later we found out that we had been awarded this status! 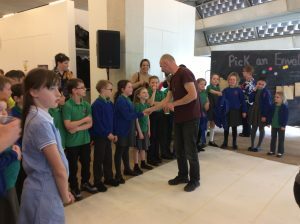 Thanks to the excellent collaboration between the class-teachers, the Creative Practitioners and the Creative Agent, our first year of the Lead Creative School’s project was extremely successful and we were proud of share our practice nationally. We are now ready to embark on the second phase of our project in 2017-18. The Arts Council of Wales believe that creativity is essential to the success and fulfillment of young people; that it is the basis of lifelong learning, and that this begins in our schools. The aim of the Lead Creative School’s Scheme is to improve outcomes for children, in literacy and maths, as well as other subjects, through engagement with the arts and creative approaches to teaches and learning. Lead Creative Schools nurture and develop the creativity of learners so that they achieve their potential, grow as well rounded individuals and are prepared with skills for life. They help to make sure that in a rapidly changing world, children and young people in Wales are able to meet the needs of the economy and to thrive within the increasingly competitive environment of day-to-day life. Why did we want to be a Lead Creative School? Our teachers work very hard to deliver a curriculum which is engaging and motivating for the children that we teach. We hope to provide children with opportunities which help them to develop skills across the curriculum and the skills that they need to understand the world around them. These are reflected in the way that we approach teaching and learning and in the skills that we aim for our children to develop. We applied to become part of the Lead Creative Schools scheme to give us the opportunity to further develop teaching and learning within our school, making sure that we provide the best possible outcomes for our children and helping them to become life-long learners. After we were appointed as a Lead Creative School the children in Year 3 and members of our school council worked with our teachers, and our ‘Creative Agent’ Vicki, to appoint a Creative Practitioner to come and work in our school. During the interviews we came across two brilliant people, Ben and Ed, who we believed could help us to achieve our vision within school. Luckily Ben and Ed were more than happy to work together and along with our teachers and the children in Year 3 they were able to begin planning the project. The aim of our project was to help children to develop skills in literacy, through their engagement with the arts. We wanted to provide the children with opportunities to develop their spoken and written language in a meaningful and exciting way. 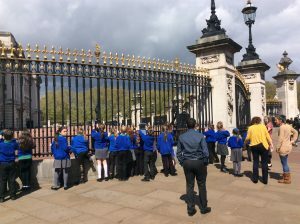 We chose the local area as a focus for our work and our teachers worked closely with Ben and Ed to explore the ways in which we could help the children to develop their literacy skills whilst also learning about this theme. Whilst all of the adults had lots of good ideas, the children in Year 3 have played a huge role in ‘leading the learning’ throughout the project and the great success that we have seen has been a credit to their interest and engagement! 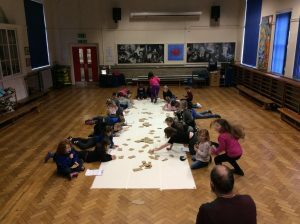 During the project the children have explored the local area, investigated the history of clay and brickworks and dug up their own clay which they have worked with during the art sessions. They have reflected upon what the area was like in the past and what it will become in the future- samples of all of the work that the children have created will be buried in a time-capsule during our celebration afternoon so that people in the future can find out more about what the local area is like now! Throughout our work in art and music we have explored the ways that we can language to describe and explain what we have found out. We hope that you enjoy sharing in the success of this project with us! We were privileged to be invited by The Arts Council to showcase our work at the Tate gallery in London. We worked with Ben and Ed to create a new rap based on our journey down to London, and made clay sculptures.